International reiner, Tim McQuay got started in reining in the 70s and earned his first National Reining Horse Association money in 1978. That landmark event came at the NRHA Futurity when it was still held in Columbus, Ohio. He is reining’s first million dollar rider. Thwarted by #Blizzard #Stella in this interview. We had a go at it again under the cover of over a foot of #NewEngland #snow! Hope you enjoy this VOD version of Angelea’s live talk with reining legend Tim McQuay of McQuay Stables in Tioga, Texas! Angelea – I’m Angelea Kelly, and you’re watching HorseGirlTV. Today we are talking to quite literally a living legend in the reigning world, Mr. Tim McQuay. Tim thanks for coming on the show. Angelea – Yes, good morning. I know it’s probably wonderful down there in the grand state of Texas, I’m guessing it’s quite warm and you don’t have snow like we do here. Tim – No, we don’t have any snow. it’s a little cool today but we don’t have any snow. Angelea – [laughing] Right on. For starters, I mean there’s so many things, so many avenues we could go down with you and the reining world, and your history and all of the amazing things you’ve done; just you are the – you were the first – and will forever be the first million-dollar winner in the reining world. But what I think is really unique about you guys is your stable is the final resting place for two of the most winningest reiners of all time. So I’m kind of wondering, how has their legacy shaped your training and your breeding programs on your breeding philosophies? Tim – Well, Hollywood Jack was our first major stallion that we thought we could read a lot of mirrors to, and he was great to me. We were fortunate enough to buy him after I was done showing, pretty much, and I got a text message, and I won the derby, I won the Super Stakes, at that time the Super Stakes was still going. But he was just one that we were starting to breed quite a few mares to in Minnesota, and being in Minnesota and trying to breed mares is not real easy. So we made a decision to place her in Texas and move to Texas in 1989. Angelea – And from there on, he bred… well the first year we owned him we bred eighty mares to him, and the second year we bred a hundred mares, and we bred over a hundred mares to him pretty much until he was done breeding. Angelea – Wow. and then he retired on your property and passed on your property as well, no? Tim – Correct. And the year that we lost him, we were very fortunate that Kim and Deborah phone kind of wanted to get out of the breeding business, and of course they were in New Jersey, and they offered a gunner, Colonel smoking gun, and we ended up making a deal with him. And he was another one that just set the world on fire. Angelea – Seriously, and produced some amazing amazing stallions and talent in his lifetime, no? Tim – Oh yes, he is the only stallion that produced horses that were first and second in the reining paternity, which the reining paternity in our business is the biggest reining that you can win. And you know, there’s not another stallion that’s done that. Angelea – And then he also retired, and he passed not too long ago, was it 2015? 2014? Tim – In 2013 we lost him, and believe me it was a big loss. Angelea – I mean a lifetime with two top talents, but just probably the connection that you had with them as far as the competitive field goes is unimaginable I would think. Angelea – It was, it was. You know, I don’t know how we could be so lucky to have two stallions like that hit back-to-back. Angelea – Well, you talk about luck and having two stallions like that back to back, but then you also have this top stallion coming along now, don’t you have a new ride, is it Yellow Jersey? Tim – Yeah, Yellow Jersey. Angelea – Could you tell me a little about him? Tim – He’s a very very pleasant horse to be around, one thing that made me like him is I won the reining paternity on Mr. Melody Jack, and he is out of a daughter of Mr. Melody Jack. And Hollywood Jack, being in the background of all the horses that I really like, he was kind of the… he was a sire of the start of a lot of horses that I did very very well on, and I always like to see Hollywood Jack in their bloodline, so that helped me. And then I got to show him in… 2012 I think it was, when we didn’t own him. We had a competition in Kentucky, and when I showed him I probably rode him four times, and he went out there and tried hard for me = I was the third or fourth – and he was just very very pleasant, just a super nice horse to be around. And that kind of helped me make up my mind. Tim – e bought him in 2013 also, we bought him in the fall of 2013 so we didn’t get to read any merits until the spring of 2014. And also we took him to Kentucky for Mandy to show to try and qualify for the Wig Games, and she got qualified on him and went to France, and the rest is history. They were the gold medal team, and USA swept gold silver and bronze that year, the riders… it was a very very good horse show for the USA. Tim – Yeah well it’s very fun. Angelea – You got a little ahead of me, I wanted to mention Mandy because you do have this immense talent that runs in your family. When did you realize that Mandy would be such a top competitive non-pro? Tim – Well, Mandy started showing pony hunters when she was probably five or six years old with her mother Colleen, and that made her kind of have a very good feel for the show ring, period. First time she showed she was 10 years old, we still lived in Minnesota. She talked me into entering her, and the only thing she told me later on was that… you know you get him all ready and then you run around to where you can go watch them, and from the time I ran around to go watch her, she said “I almost went back to the barn” [laughing], she was scared. That’s just not Mandy anymore though. She went and showed and did quite well. Angelea – Evidently not, [she’s a] gold medal winner. Tim – Yeah, she got over that! Angelea – And so family, this horse business runs your family. You mentioned Colleen, you guys also have a successful hunter-jumper program, is there any way that you see hunter-jumpers and reiners comparing or complementing one another? Because I’m guessing you guys run through the same stable, or at least adjoining stables. Tim – Yeah, you know Colleen has a role in barn with her own setup, which is really the only way you can make it work very easily just because you got too much going on in one place. But her business has been very successful the whole time we’ve been going, and you know the horse business isn’t necessarily easy and sometimes when we’d be needing something, she’d get lucky and sell a horse, bring up our budget back to where it should be, and then I’d sell one the next time to keep it going. It’s just definitely complemented. Angelea – It’s a unique family business it sounds like, with that give and play with both of those. Tim – Yeah. At our place we really have three divisions: we have the breeding division, the reigning division, and the other division. Angelea – Wow, that’s a big operation. Tim – Little bit like a business. Angelea – [laughs] there you go, that’s the way to go about it. So there’s this national reining breeders show that’s coming up in Katy, Texas next month, could you tell me a little bit about that? Because it’s a pretty big deal, from what I understand. And how did that whole thing come about? Tim – Yeah. In 1997, [coughs] – excuse me – really 1996, Colleen and I took over a horse show that was going on in Guthrie, Oklahoma at Lade arena, and we just had a regular reining with the Derby and stuff in it. So in 1997, we started talking just amongst the reiners and with Colleen, and we decided we should try to put together a breeder’s/horse show situation. So we just put some outlines together, and we got it so the Stallions paid a certain amount to have their colts show in this, and then you had to pay the babies up in the fall of their baby year. And we take all that money, put it in the bank, and then four years that money is our prize money for this horse show. Tim – So it started in 1998, that was our first one of which all we had was the stallion money to use for prize money, so it paid its probably $20,000 to win that event when we first started. and that went for four years like that, until we had the money from the babies go in, and then it popped up to where we had a lot of money to pay out at this horse show. Angelea – Nice. So this is 20 years almost, this is your 19th year then? Tim – This is our 20th year. Angelea – 20th year, wow. Well, there’s about a bajillion questions that I could ask you from just your history in reining and all the amazing things you’ve done, but I know you’ve got to get out there and get on some horses, so I’ll let you go. But thank you so much for coming on the show, I really appreciate your time. Angelea – Well thank you, I appreciate your time. Angelea – Awesome. This has been HorseGirlTV, I’m Angelea Kelly, and we will see you next time. 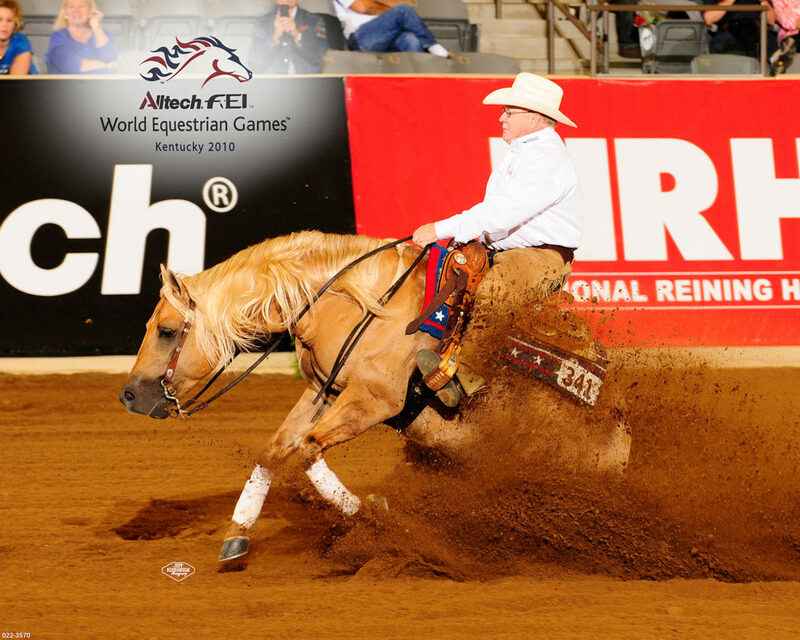 ← Tennessee Walking Horses and Field Dog Trial with Larry Garner + Fox Chasing, Steeplechase, and more!